Raising pigs on pasture is a great way to fill your freezer with great organic meat, and maybe put a few dollars in your wallet, too. We've been putting pigs on pasture for 9 years here on New Terra Farm. We usually do one or two 'batches' each year, depending if we are busy with other stuff. We have raised as many as 8 pigs at one time, which is about the limit of our capacity in both freezer space and free pasture. 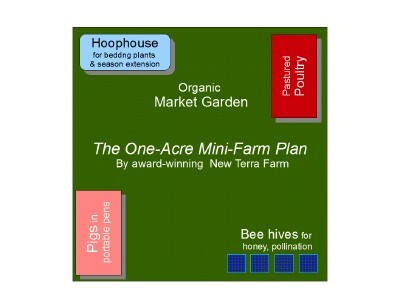 New: Download my free Mini-Farm Plan report. 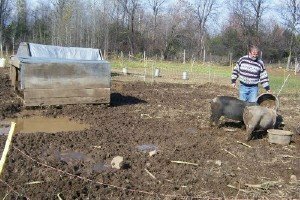 Learn how we integrate raising pigs, meat chickens, and an organic market garden, on just one acre! Enter a valid e-mail address and the report will be mailed to you, along with even more practical, useful farming information. Note: please make you enter an address you can access afterward, as this is the only way I can send you the report. Organic pork is delicious and profitable - you can expect to make about a 50% profit on your pork, because it is a premium product. We have customers coming back year after year because the pork is SO tasty. 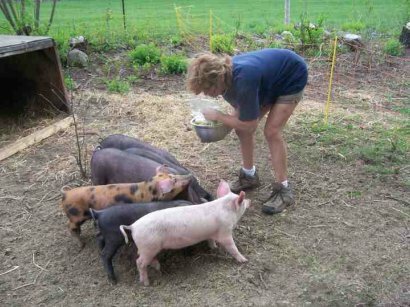 Here's a quick how-to guide to start raising your own tasty pastured pork. Decide how many pigs to raise. Consider how many pigs you want for yourself, and how many you might be able to sell. Also consider the freezer space you have available. 2 piggies will just about fill a 14-cubic ft freezer. Find your feed supplier.Your best choice is to buy feed from a local organic farmer. Ask around to find a local grain grower. You can also buy commercial organic hog feed. Get your equipment. You will need a trough for feeding, water bowls, and electric fencing to keep your pigs in. You will also need a simple hut for shelter. Get your weaners Again your best choice is to buy weaner piglets from a local farmer. Ask around to your friends and neighbouring farmers. Your other option is to buy some weaners at an animal auction, but try to find a local farmer first. Set up your pen area. Place your pigloo and waterers and feeders in their starting location, and hook up your electric fence. Provide feed and water twice-daily, and move the piggies when they have rooted up all the ground in their paddock. Depending on feed, and how big your want your pigs to get, in somewhere 4 months they will be ready to go to the abattoir. Book ahead; some abattoirs have wait times of several weeks, especially during the busy summer months.